Dear Mr. President, an exhibition organized by the Swiss Arts Council Pro Helvetia office in Cairo, showcases the fruits of a six-month residency in Cairo by Swiss artist Jean-Luc Marchina. Running from 29 July to 3 August at the Cairo Atelier, the exhibition looks at the Egyptian youth and their expectations for the new president of Egypt. The artistic fruit of Marchina’s residency is on display at the Cairo Atelier, a small downtown exhibition space. The exhibition, entitled Dear Mr. President, is executed with very simple means: a few photographs showcasing the youth from the lower and lower middle classes, and a video installation presenting youth addressing the president with their hopes for the future. It is possibly this striking simplicity that shocks the viewer, reminding us that Egypt that is still heading in new and unpredictable directions. Marchina’s letter, which accompanies the project, is his artistic quintessence that aims to draw the president’s attention to many issues troublesome to the Egyptian nation—and especially its youth. In his photography, Marchina tries to escape clichéd images. He looks at the lower middle class in known Cairo hotspots, giving them a different angle. He creates an interesting thematic juxtaposition by approaching children and teenagers who are surprisingly innocent despite the revolutionary backdrop. 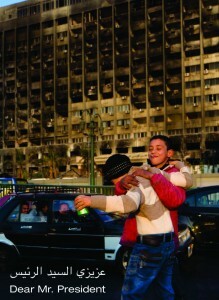 We find boys who apparently come from the impoverished social strata, playing on the street in front of the National Democratic Party building (the ruling party under Mubarak) that was burnt during the initial 18 days of protest. Another work presents boys eating Koshari, an Egyptian street food made of pasta and beans, beside the concrete wall erected by the army around Mohamed Mahmoud Street. That neighbourhood faced the most violent encounters between the police and the protesters in November and December 2011 and February 2012. We also see a family seated at the doorstep of their house; despite their striking poverty, there are smiles and hope on their faces. Today, many Egyptians believe that the revolution that toppled Hosni Mubarak in February 2011 did not manage to disassemble the regime and did not realize many revolutionary goals. But the voices that are asking for change can no longer be silenced, and they reverberate on the streets on daily basis. In his short video, Marchina collected views of young people addressing the future president in the weeks and months prior to the elections. Marchina addressed mainly students, the upcoming generation of young intellectuals, and found in them a lot of faith and optimism. So many concerns are tackled by the youth in his interviews: piling social, religious, and political pressures, corruption, injustice, lack of jobs, failing education, women’s rights that are not met, and the revolution’s unattained goals . . .
“I wish that the coming president would do his job,” states one young man in the video, possibly not realizing that this seemingly simple statement encompasses an endless list of demands that his generation enumerates. “He should respect the dignity of human being,” says the same man reflecting on many young people’s call for core rights such as dignity, respect and basic human rights. Another protagonist, a young woman, underlines need for education, pointing to ignorance that is apparent in many parts of the country, extending from lack of scientific knowledge to political ignorance. Women’s rights are among the topics brought up by two women, opposing the discrimination that they experience in social and academic circles. One of the recurring demands is freedom of expression. The video has numerous statements asking for the “freedom of thought, freedom of opinion, freedom of education,” and asks the president to accept all forms of criticism. Marchina believes that despite many daily worries, and they Egyptian youth remains optimistic. Sadly, one woman in the video thinks that her expectations are dreams beyond reach. She mentions the fight against corruption and social injustice, and stresses that her revolutionary dreams are shattered. She is waiting for someone who will lift Egypt, who will lead it towards the future and would not drown it in the past. Even though today we know that Mohamed Morsi is the new president of Egypt, Jean-Luc Marchina’s exhibition does not look into a specific presidential figure. 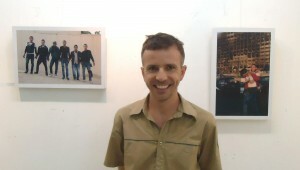 Dear Mr. President is rather an exhibition that looks into the major concerns of the Egyptian youth. Those concerns need to be addressed to the leader who claims or hopes to respond to—if not all, then at least a majority of—the demands expressed by Egyptians.